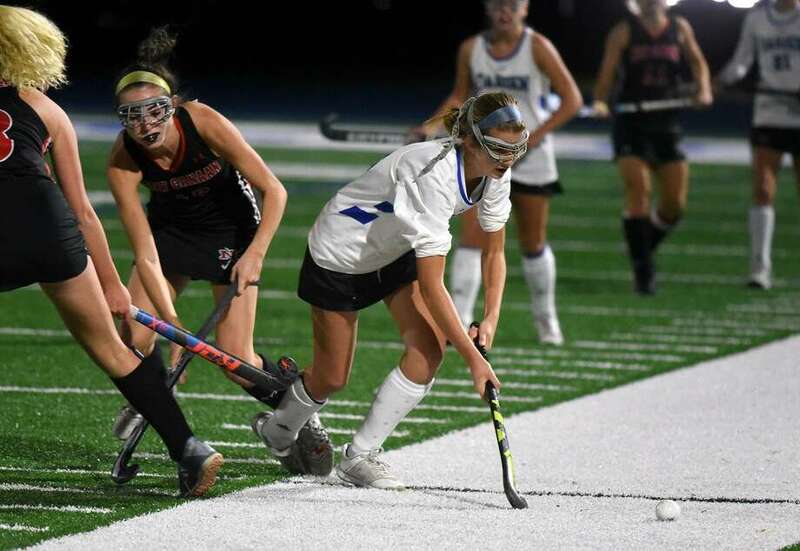 Darien's Shea van den Broek moves the ball during a 3-2 win over rival New Canaan in the Class L field hockey playoffs on Wednesday, Nov. 7, 2018 in Darien, Conn.
DARIEN — With the memory of a six-goal loss to rival Darien not too far in the rearview mirror, it would’ve been relatively easy for the New Canaan field hockey team to call it a day when the Blue Wave scored three early goals in their state tournament clash on Wednesday. Darien’s offense was led by senior co-captain Shea van den Broek, who scored twice and now has five goals in the last three playoff games. Molly Hellman also hit the back of the cage, and senior co-captains Katle Elders and Bridget Mahoney had assists.